I spent a little over a year working with Clickworker. This is for anyone who wondered if Clickworker was a scam and hopefully my proof of payments will prove that it’s not. This is for anyone who wondered if Clickworker was a scam and hopefully my proof of payments will prove that it’s not. I spent a little over a year working with Clickworker (UHRS only). I tried to work a couple of hours each month or more to sustain decent payments from Clickworker. To receive a payment, you need to have at least $5. Below are screenshots of all my invoices from working. As you can see, my payments started out small but when I got the hang of it, my payments started increasing. As I said earlier – I only worked a couple of hours each month. Sometimes more – sometimes less. I put all my payments into a spreadsheet to add them up. 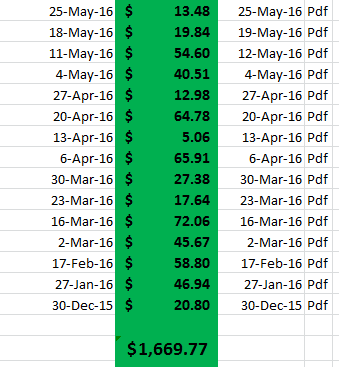 Total comes out to $1,669.77 since I started. My 2015 form 1099 from Clickworker was $1,022.67. 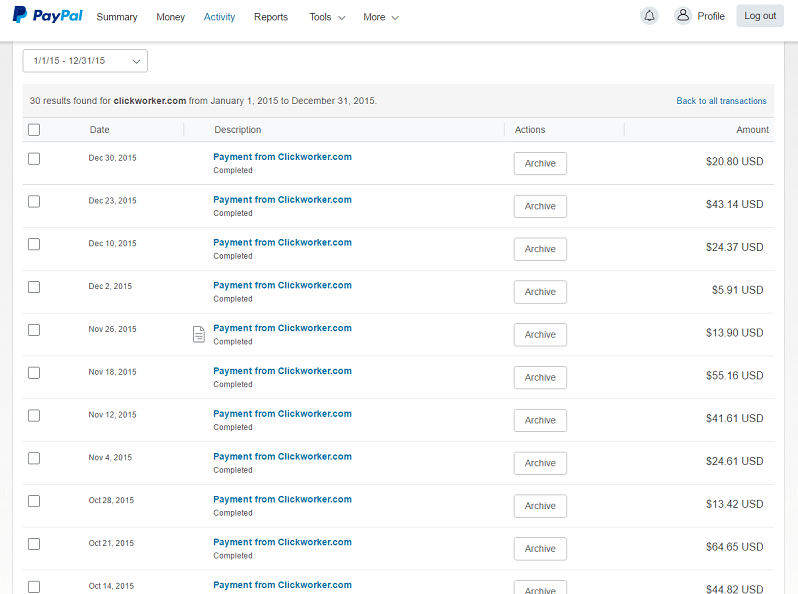 Lastly, here is a screenshot of some of my PayPal payments received from Clickworker as further proof. Check out my YouTube video of how to join Clickworker and exactly what you need to do in order to start earning an income. If you have any questions about Clickworker, let me know and I’ll try to answer to the best of my knowledge.